AP0259 , DDD - TT: 42'37"
In the history of music the name of Julian Fontana is strictly associated with that of Fryderyk Chopin. Both artists remained close friends for many years. 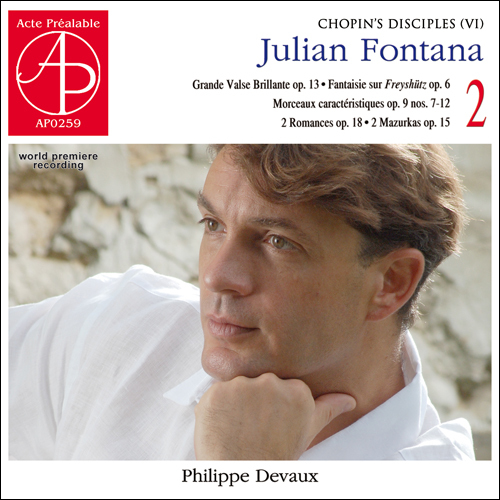 Fontana was himself a concert pianist, a composer, a writer, and a musical activist and yet all these extensive spheres of his artistic activity were permanently and effectively overshadowed by his association with Chopin. The series of piano works by Julian Fontana presented here reflects all the formal, technical and textural tendencies found in Romantic music. They are full of national characteristics, virtuosity and striking expressive devices. Most music lovers are not familiar with Fontana's piano output, which is a shame as it very much deserves wider recognition. Its single most valuable trait is the texture, which bears witness to the artist's proficient command of the instrument. Fontana's piano works are formally and harmonically simple and straightforward. Their most creative technical aspect is figuration, sometimes quite standard and passage-based, and at other times more varied in structure and number of parts, as well as textural personification. It also reveals the composer's liking for variational techniques, especially the type of ornamental variation and early Romantic style brillant.